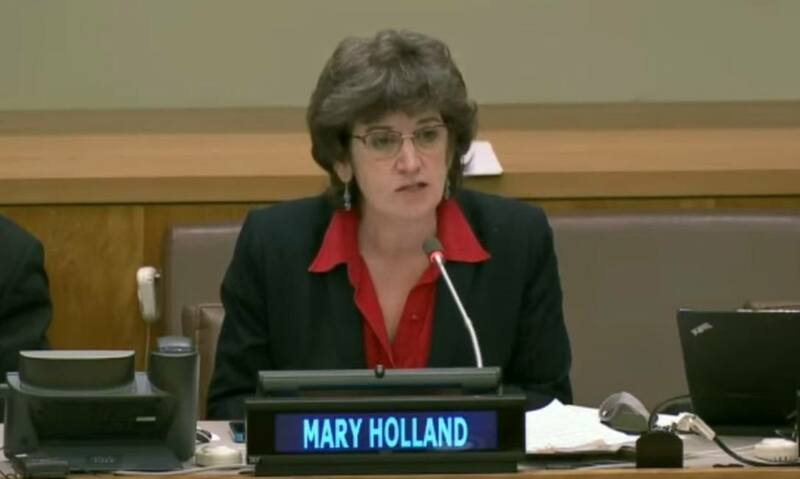 New York University research scholar and law professor Mary Holland recently addressed the United Nations at the 25th International Health and Environment Conference. Professor Holland has been one of the lone voices in the U.S. addressing the legal ramifications of removing parental rights to informed consent for childhood vaccines. Professor Holland sees major civil rights issues involved in government vaccine policies that remove informed consent rights to refuse mandatory vaccinations. She reminds the United Nations that history has shown us the results of such overt government intrusion into personal medical rights. World-wide human rights legislation has been put into place to protect individuals from government intrusion into medical abuse, starting with the Nuremberg Code just after the atrocities of Nazi Germany after World War II. Professor Holland states: "[T]he UN and the international community have obligations to respect human rights related to vaccination. Since World War II, the international community has recognized the grave dangers in involuntary scientific and medical experimentation on human subjects. In the aftermath of Nazi medical atrocities, the world affirmed the Nuremberg Code which stated that the 'voluntary consent of the human subject is absolutely essential.' The International Covenant on Civil and Political Rights further enshrined this prohibition against involuntary experimentation in its 1966 text, stating 'no one shall be subjected without his free consent to medical or scientific experimentation.' Such a prohibition is now so universally recognized that some courts and scholars have pronounced the right to informed consent in experiments as a matter of customary international law." As a unwitting subject of unauthorized covert human experimentation can relate those, who have been negatively effected by forced vaccination, and it's adverse effects. Across Canada, we have thousands of children, subjected to various Nuremberg Code violations, yet no office nor advocate, in respect to breach of fiduciary duty, and the criminal code. Just as St Michaels College School, has been held to account for it's breach of the criminal code, I see no reason, as to not provide the same enforcement, scrutiny, and over-sight, when our medical profession remains a risk, when there is no transparency and accountability, for decades of covert chemical and surgical experimentation. Interesting on how JFK's missing left temporal lobe brain tissue remains unaccounted for, while I have a diagram of a foreign left temporal lobe brain tissue, in my Toronto HSC records, along with X-rays demonstrating brain tissue in the resected areas, secured by 43 metallic implants. And no where to report, or address this serious breach of the criminal code. I appreciate what Mary Holland is trying to do, but I disagree with her in certain important respects. I am not anti-vaccine. I am anti-government-vaccine-program. Let vaccines be offered through the free market, with all of its attendant checks and balances, with informed consent, and allow people to decide to what extent, if any, it wants to purchase these products. But as Ringo once said, everything the government touches turns to crap. Or as Milton Friedman once remarked, if you put the federal government in charge of the Sahara Desert, in five years' time there would be a sand shortage. Governments have no objective means for balancing the interests of individuals versus the (alleged) interests of the collective. They only know how to violate the rights of individuals, to serve their masters. It is time to end the government vaccine program (in its entirety) and for there to be a separation of vaccines and state. One correction, Australia is now coercing it's citizens into vaccination with it's 'No Jab, No Play' and 'No Jab, No Pay' policies. Excellent address by Mary Holland. Someone with common sense regarding this issue and someone who is able to stand up and state her case so eloquently. When I was young we didn't have vaccinations for measles, chicken pox or mumps. They were considered normal childhood diseases. If children in the local community caught any of them all the local children would be encouraged to play with them so that they could catch the disease and get it over and done with before they grew up. How things have changed in my lifetime, what has happened to freedom of choice and when did parents lose their rights in protecting their children. Vaccinations are not safe for all children. Children should be tested first to see if they will react to the vaccines adversely, not wait until they are vaccinated and then see the terrible results. We shouldn't play Russian roulette with our children's lives, they are too important. Thank you Mary Holland for speaking out about this controversial subject. Thank you very much to Mary Holland for this excellent statement. I would add only that in all deliberations and decisions about vaccination policies, ACCURATE and COMPLETE information about the efficacy of vaccination, and the incidence and risks of adverse effects of vaccination, must be considered. Much of what is widely accepted as "settled science" regarding vaccination efficacy and safety is in fact "medical mythology." Works such as Suzanne Humphries' book "Dissolving Illusions: Disease, Vaccines, and the Forgotten History" should be required reading for all involved in vaccine policy deliberations and decisions. And in the face of disagreement about vaccine efficacy and safety, "First do no harm" and the Precautionary Principle should dictate that the freedom of patients, and parents of minor patients, to refuse vaccination must be perfectly preserved.